Seyfarth’s Distressed Situations Resource Team, supported by Seyfarth’s Bankruptcy, Tax, Real Estate, Litigation, Environmental, Labor & Employment, Wage & Hour and Construction practice groups, is an international, cross-disciplinary group of attorneys with extensive experience counseling clients on how to prepare for, and navigate through, distressed situations. 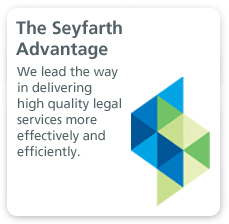 Additionally, Seyfarth is positioned to help clients take advantage of the opportunities presented by a distressed marketplace. Whether representing a lender or a borrower, a landlord or a tenant, an investor or developer, our experienced national real estate team can assist with all aspects of a distressed real estate asset. Our attorneys have extensive experience with CMBS and portfolio loan workouts (from pre-negotiation agreements to forbearance agreements and including loan modifications and restructurings), lease restructures, loan sales and purchases, foreclosures, deeds in lieu of foreclosure, non-judicial foreclosures, and management and sales of REO. Our real estate attorneys also work side-by-side with our litigation, bankruptcy and construction attorneys on matters such as receiverships (including receiver sales), judicial foreclosures, and construction matters (including payment claims, mechanic’s liens, and project completion issues). For lenders in high volume distressed situations, we utilize technology and project management to help our clients create efficient processes and identify trends to better inform decisions. The Real Estate & Finance Litigation Group represents real estate lenders, developers, owners, landlords, tenants, contractors, guarantors, real estate brokers, and related professionals and investors who may be affected by changes in the value of property or of another party to a real estate transaction, or by changed demand for space. Our attorneys counsel clients regarding strategic planning for real property-related interests, both before and during distressed crises, and use litigation as a tool when necessary, whether to foreclose a loan, obtain a judgment on a guaranty, terminate a tenancy, or enforce rights of landlords, lenders, borrowers, real estate brokers or other creditors in bankruptcy proceedings or out-of-court restructurings. Our collaborative Construction Group includes attorneys who are LEED certified professionals, licensed architects and engineers, and former construction industry professionals. In distressed asset matters, we assist with project completion issues, delay and other contract claims, defective design and construction claims, performance bond liability claims, warranty claims, lender liability claims and mechanic’s lien claims. Our Corporate and M&A attorneys help navigate business owners through distressed situations. We work with our clients to assess and explore turnaround options, determine the best strategy for the company, and expedite execution. We help clients evaluate credit exposures, negotiate with lending institutions, sell assets or businesses, identify merger opportunities and, if necessary, represent them in connection with formal bankruptcy proceedings. Our Bankruptcy & Workouts practice offers litigation, distressed finance, and mergers and acquisitions experience. Our litigation services include maximizing claim recoveries for creditors as well as protecting and enforcing interests of individuals and companies that have relationships with troubled entities. We also assist distressed companies seeking financing, such as debtor-in-possession financing or asset-based lending, and we reorganize these same debtors by helping them to restructure as viable companies. With respect to distressed mergers and acquisitions, we identify opportunities for investors and match distressed companies with potential acquirers. Our bankruptcy transactional practice also advises clients on the purchase and sale of distressed assets. The Firm’s environmental practice has considerable experience in identifying and assessing the environmental risks of distressed properties including those associated with: (i) contamination in soils, groundwater and vapor encroachment; (ii) environmental conditions that may affect buildings and structures (asbestos, mold, lead based paint, contaminated dust); and (iii) abandoned equipment which may have contamination requiring cleanup or contain products or wastes that must be disposed as hazardous materials. Once identified, we assist clients in evaluating, balancing and transferring risks using legal tools (such as remediation agreements, indemnities, prospective purchaser agreements, covenants not to sue and comfort letters), and managing environmental risks in a practical manner to ensure abandoned wastes or contamination at distressed properties are properly handled and removed in a cost effective manner. Our team of experienced attorneys helps clients understand the tax implications associated with distressed debt situations. We work with clients to arrange the most efficient structures in order to minimize tax exposure and future litigation. 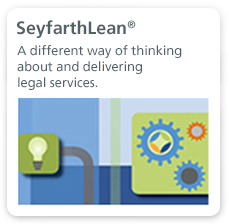 Seyfarth’s extensive, and nationally acclaimed, labor, employment, and benefits experience can assist with all aspects of distressed transactions, business restructuring, and workforce reductions, such as negotiating transaction terms, bargaining with unions over revised labor agreements, revising employment policies, and terminating or revising pension or other benefit plans. 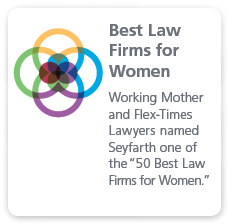 Seyfarth’s wage and hour practice has extensive experience in representing clients throughout the country in state and federal courts in this complex area of the law. Members of the group have drawn on their substantive knowledge to successfully represent clients in cases before state courts, federal district courts, federal appellate courts and federal and state administrative audits covering virtually all aspects of the law. The group has also proactively counseled clients relative to wage and hour compliance with the goal of eliminating the risk of adverse litigation results and keeping clients aware of the latest developments in this field.